Terminology is very confusing when learning the golf swing so the Arnold Palmer Golf Academy Professionals create drills to produce the feel rather then explaining them with words. Release is a commonly used term but is rarely understood without further explanation. 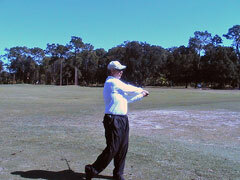 Simply put releasing the golf club means rotating the forearms and hands to produce club head speed and square the clubface to produce a straight golf shot. This explanation defines release but unless you feel the actual motion it will be hard to replicate on the golf course. 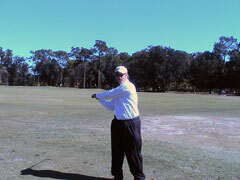 The APGA professionals utilize the “baseball drill” to help the student feel release. 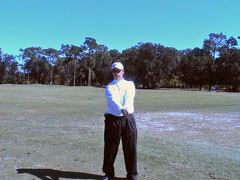 The drill is done with the student holding the golf club (with the proper grip) directly in front of them at shoulder height, similar to a baseball player swinging a bat. From this position you need to swing the club back and forth and you will feel the forearms rotate over each other which is “releasing the club.” This drill starts at shoulder height and can be lowered slowly to the regular hitting position where the actual swing will take place. You will notice right away how easy it is to create the feeling of the proper release and with repetition you will be able to produce much straighter golf shots. Keep practicing and if there is anything we can do to help you in your game, contact us, or go to our website and look over the golf instructional programs we have available to you for this coming winter. The best way to keep your game fresh in the winter is to travel to Saddlebrook Resort in Sunny Florida and Play with a Pro . Saddlebrook Resort is rated One of the Top 100 Golf Resorts by Condé Nast Traveler Magazine.